Strict selection criteria, precise controls of materials and assessment of suppliers, as well as stringent production inspections are the pillars of the outstanding reliability that has been Hirsch’s trademark for generations. Both external and in-house inspections ensure the high quality of all Hirsch products. The certification according to ISO 9001:2000 is more than a compulsory exercise. 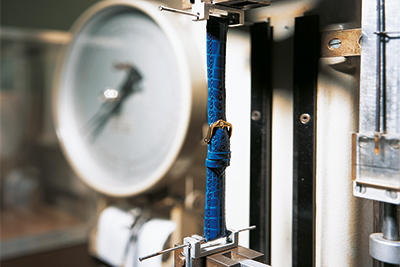 Justifiably, our customers worldwide rely on the quality standards that Hirsch sets in the production of bracelets. Perfected production technologies and centuries of experience in the processing and refinement of leather are guarantors for quality and functionality that exceeds the expectations for a "conventional" watch band by far. the lining leather - the bottom of the bracelet that is in constant contact with the skin which it embraces so gently, smoothly and firmly. 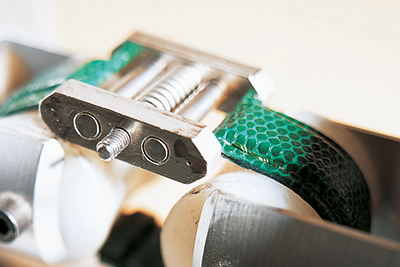 These three elements of the bracelet are inseparably connected by the Remordé technique developed by the company‘s founder, Hans Hirsch. All elements are connected down to the fibre so that the bracelet is protected in an optimum fashion against harmful external influences during daily use. The Rembordé technology, developed, patented and continuously refined by Hirsch, joins upper and lining leather without any seam. Hirsch bracelets last longer. Even with daily use. The Rembordé technology guarantees optimum protection against external influences, as well as high resistance and durability of each Hirsch bracelet! Hirsch bracelets are generally water resistant and dry much more quickly than conventional watch bracelets. Hirsch bracelets can get wet. Their visual appearance, suppleness and functionality are by no means impaired. Sweat is genuine leather’s greatest enemy! Conventional straps often become brittle after a short while of wear and even break in some areas. With a Hirsch bracelet you can take your watch anywhere. Hirsch bracelets are sauna-tested. Even the combination of heat, moisture and sweat does not harm them - they keep their shape, are comfortable to wear, and therefore a long-lasting adornment for any watch. The term Artisan Leather describes a carefully selected collection of bracelet models that are produced from hand selected materials and consciously produced according to traditional craftsmanship. The leather types used are obtained mostly from Italian tanneries in and around the small town of Santa Croce in Tuscany, were time honored processes for production and preserving of leather are utilised. A declaration of love to an exceptional watch. This art of leather refinement, which has been cultivated for centuries, along with the experience Hirsch brings in production, permits lovers of classically elegant bracelets to adorn their watch with an item of timeless beauty and superb workmanship. The natural Louisiana alligator grain is embossed on particularly fine calf skin with a specialized process. Perfect alligator effect - the alternative to genuine alligator. The characteristic alligator grain is reproduced with the variation of dark and light shades between the scales. Hirsch Alligator embossed is also available as 100 m Water-Rresistant! The models of the 100m Water-Resistant series can be worn even at 100 meters ocean depth without losing colour, shape, suppleness or visual appeal. The leather bracelet that goes diving with you. The bracelets will get moist, but thanks to the Hirsch Rembordé technology and water-resistant padding material made from leather fibres - they absorb significantly less water and dry much more quickly than bracelets made from conventionally tanned leather. Particularly sturdy raw leather is given a scratch-resistant surface finishing - developed by Hirsch - which protects the bracelet from abrasion. The leather bracelet for the most severe demands. In addition to being extremely scratch-proof, Hirsch scratch-resistant bracelets are made to resist sweat and water, and therefore can withstand the most severe demands. At the same time, they feel pleasantly soft on the skin. Hirsch Premium Caoutchouc is obtained exclusively from high-quality natural caoutchouc and refined with Hirsch-specific additives. That material guarantees a considerably longer service life and makes the bracelets more comfortable to wear than bracelets made from conventional synthetic materials. The best sports bracelet on the market. Hirsch Premium Caoutchouc is considered to be the best raw material for functional bracelets anywhere! Hirsch caoutchouc bracelets are highly elastic, tear resistant, gentle on the skin (no allergy caused by latex) and resistant to external influences, such as water, UV-light or chemicals. 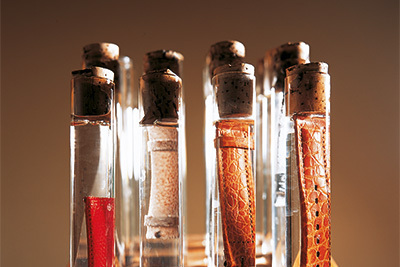 In cooperation with the First Vienna University Clinic for Dermatology, Hirsch concluded the development of a hypoallergenic coating for leather bracelets in 1980. The result is sensational: now allergy sufferers can wear their favourite watch. With the Pro Skin coating used by Hirsch worldwide, nearly 100% of allergies caused by wearing leather bracelets can be prevented based on medical criteria. In addition, all metal parts used by Hirsch for the bracelet - particularly the buckles - are offered in low-nickel quality. An additional feature of Hirsch bracelets can be seen in products showing the Leonardo icon. These bracelets have been specially developed for watches which are envisaged as having a seamless connection between the watch case and the bracelet. With this technology Hirsch is able to extend the integrated look (which is typical nowadays at the high end of the watch segment) to other watches also.